STATE Government is ruling out removing Gold Coast shark prevention drumlines, slamming Opposition claims to the contrary as "scaremongering" and risking tourism for political points. 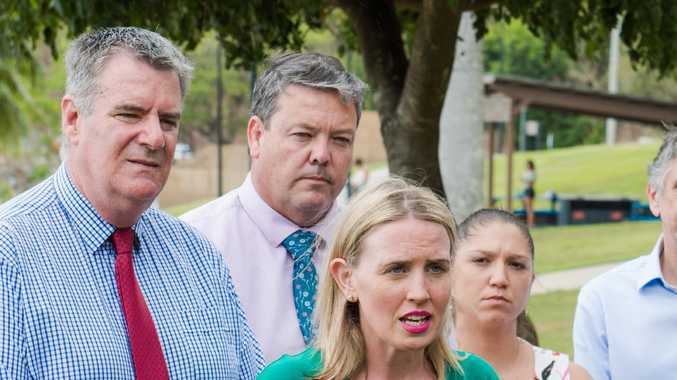 Opposition leader Deb Frecklington and senior MP John-Paul Langbroek yesterday stoked fears Labor's State Government is "secretly considering" phasing out drumlines as political fallout from the latest Whitsundays shark attack fatality turned nasty. State Government is against drumlines in Whitsundays' Cid Harbour where young doctor Daniel Christidis was fatal mauled on Monday. Stacey and John-Paul Langbroek have decided against a family holiday any time soon in the Whitsundays. Picture: Regina King. Asked if it could rule out removing nets or drumlines on the Gold Coast, a spokesman for Premier Annastacia Palaszczuk vowed: "Yes, we can rule it out." But LNP leader Deb Frecklington, citing meeting minutes showing State Government leaving the door open to replacing drumlines, told the Bulletin: "It is almost criminal the Palaszczuk Government is secretly considering phasing out drum lines up and down the Queensland coast including the Gold Coast." Minutes late last year of the Queensland Shark Control Program Scientific Working Group which includes top fisheries bureaucrats detail Government responses on Great Barrier Reef drumlines. One Government response addressing drumline use says "formal assessment of alternative technologies may be considered by the scientific working group". Mr Langbroek said: "If they are not prepared to do it in the Whitsundays, doesn't it suggest it's the thin end of the wedge and they may look to reduce the netting program over time on the Gold Coast because surely the same principle applies. Daniel Christidis was fatally mailed at Cid Harbour. "You need to reassure the populace they are going to be safe and the Government is not doing that," Mr Langbroek said. "We need to see the conviction of Labor Government that they are committed to it and not going to do what their green tendencies are which is to say we're looking at alternatives." Mr Langbroek said his family had ruled out a Whitsundays holiday and would look at Bali or Fiji, adding a shark attack on the Gold Coast would be "catastrophic" for tourism. "A shark attack would be the equivalent of what happened at the theme parks." Tourism Industry Development Minister Kate Jones accused Mr Langbroek of "putting his own tourism industry at risk in the hope of scoring cheap political points". "It is disgusting," she said "There is no way we would move away from the current shark program on the Gold Coast." Fisheries Minister Mark Furner said it was "hopeless scaremongering from the LNP and will damage the Gold Coast's tourism industry". "LNP should be ashamed. Our decision to take expert scientific advice and not deploy drumlines in Cid Harbour has absolutely no bearing on our commitment to the shark management program on the Gold Coast."